Heavy Rain. Mostly Cloudy. Mild. Humid. Noosa is famous for its National Park and its unparalled standard of shops, restaurants and of course. 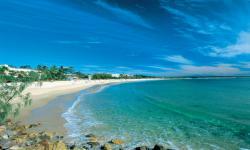 Noosa accommodation is of unsurpassed quality. The accommodation can meet all needs from the budget hostel to world class resorts. Noosa is an ideal launching point for numerous activities including trips to the Everglades and Fraser Island for 4-Wheel Driving. Discover what makes Noosa accommodation what it is and what makes Noosa one of the most exclusive holiday destinations on the Sunshine Coast. Noosa Hinterland is an area of scenic beauty that is famous for Eumundi's huge Saturday and Wednesday craft markets, as well as the area's galleries and craft shops, all set amongst stately timber forests. Noosa Hinterland accommodation listings have a wide variety of very nice Bed and Breakfasts as well as other commercial accommodation. Noosa forms part of the local conclave including Noosaville and Noosa Heads. Coolum Beach is a beachside town on the Sunshine Coast in Queensland, Australia. Coolum Beach is also the beach around which the town, Coolum Beach, is based. 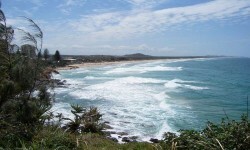 Coolum Beach is a popular day trip for tourists and holiday destination. Recently Coolum Beach has seen heavy commercial development, with new buildings for retail business and holiday apartments and hotels. Coolum Beach and the surrounding beaches of Mudjimba, Marcoola and Peregian make up the more serene side of the fabulous Sunshine Coast. Coolum offers fully patrolled surf beaches all year round. The open beaches of Coolum provide some of the best surfing available in Australia. You can view the Coolum Beaches from the rocky outcrops of Point Perry and Point Arkwright. Coolum provides easy access to local Sunshine Coast tourist attractions including The Ginger Factory, Australia Zoo and The Big Pineapple. Marcoola is above and beyond expectations in every sense of the phrase. From the stunning views of Mount Coolum to ex-HMAS Brisbane, one of Australia’s premier wreck dive sites, Marcoola’s delights continue to surprise visitors. When you have finished exploring it from top to bottom, Marcoola’s friendly community and long stretches of quiet beachfront also make it the perfect place for lazy days. Marcoola is the first stop when leaving Sunshine Coast Airport and the last stop for natural beauty from the mountains to the ocean. Marcoola offers a wide selection of trendy hotels, resorts and apartments to suit different styles and budgets on the Sunshine Coast. Be sure to look at other areas in the Sunshine Coast region. Marcoola is ideally located midway up the Sunshine Coast and treasured by locals for its excellent broad beaches and tranquil environs. It’s an easy drive from Marcoola to the Sunshine Coast Airport, 20 minutes to Noosa Heads and Sunshine Coast Hinterland (Montville and Maleny) and 10 minutes to Sunshine Plaza Shopping Centre. 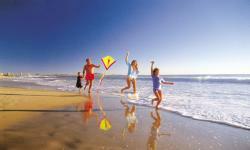 Enjoy all the activities that the Sunshine Coast has to offer from the centralised Marcoola. Swimming, sea kayaking, scuba diving, hiking in the National Parks or simply picnicking on the beautiful Sunshein COast beaches are all here when you visit Marcoola. Golf at the championship course at Twin Waters. 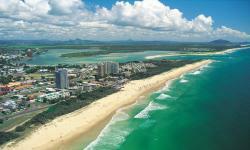 Maroochydore accommodation is affordable and varied. Stretching for 65 kilometres are the sandy beaches of the Sunshine Coast, extending from Caloundra north to Maroochydore and then to Noosa. Visitors to the Sunshine Coast can't go past Maroochydore and its surrounding centres: these include Maroochydore Beach, Alexandra Headland and the Sunshine Plaza Shopping Centre. Located in the heart of Queensland's world famous tourist destination Sunshine Coast, Maroochydore is now one of Australia's premier holiday destinations. A mean average daily temperature of around 24 to 25 provides an enviable subtropical climate, and a daily average of seven hours of sunshine per day provides the ideal environment for relaxation and holiday enjoyment. Maroochydore offers a mix of surf beach and the calm waters of the Maroochy River whose southern bank forms a number of parkland and picnic spots. Maroochydore is a major commercial area of the Sunshine Coast, but still is a relaxing seaside town. Maroochydore has the Sunshine Plaza shopping centre which is a home for over 210 shops, cinemas restaurants and cafes. The handy location to the ocean makes this town ideal for boating, fishing and aquatic pastimes such as surfing and jet skiing. Maroochydore is a venue of major surf sport carnivals. Distance from Brisbane (State Capital) is 98 kilometres. Alexandra Headland, known by the locals as 'Alex', is a small coastal community situated on Queensland's Sunshine Coast. Alexandra Headland has a relaxed and laid back atmosphere that compliments the soothing rolling surf and inviting beaches. Alexandra Headland is also ringed by Mooloolaba, Buderim and Maroochydore with a superb coastal sweep to the north and bush setting foothills to the west. Alexandra Headland's main attraction is its magnificent coastal frontage of beach, headland and parks extending for kilometres north and south. The beach has a patrolled swimming area provided by the Alexandra Headland Surf Club. On any day, visitors can enjoy watching the surfers, or better yet join them. There are many places to sign up for surf lessons and rent boards. For the skaters and bikers, there is an outdoor skate park right alongside the beach. Also provided are picnic and barbecue facilities, so why not enjoy lunch on the barbie with family and friends. While Alexandra Headland has maintained its small town charm, it is only minutes from major Sunshine Coast shopping centres and attractions. Distance from Brisbane (State Capital): 98 kilometres. Mooloolaba is a Sunshine Coast town that boasts beach and river frontages and is treasured by locals for its excellent broad beaches and tranquil environs. Mooloolaba provides a mix of harbour, beach, parks and shopping with coastal strip panoramas. It is a great place to enjoy a holiday by the seaside and houses many marinas. 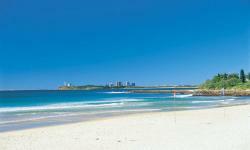 Mooloolaba Beach was recently voted Queensland's Cleanest Beach. The redeveloped Esplanade has a range of restaurants from beachfront cafes lining the streets to fine dining and many boutiquest. The Esplanade is the perfect place to relax, eat, and watch the surf. Mooloolaba is a coastal town located at the Southern end of the popular Maroochy region. Beachfront and riverfront locations are on offer along the Mooloolah River. The main beach in Mooloolaba is the Mooloolaba Spit. 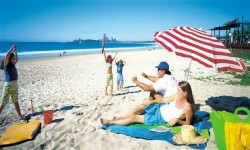 The Mooloolaba Spit is ideal for families offering pretty parklands and wonderful picnic areas. Mooloolaba one of the world's most perfect places to enjoy surfing and fishing. You can also head out to sea to enjoy a day of deep sea or game fishing right from Mooloolaba. The Esplanade is situated opposite the beach featuring a number of cafes and restaurants. There are also several shops and boutiques where you can purchase gifts, clothing and unique artwork. Another large shopping centre is the Sunshine Plaza, which is located a short distance north of Mooloolaba and offers a number of different shops and dining outlets. 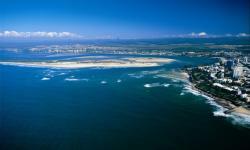 Mooloolaba is also home to a large port, which accommodates the Auckland to Mooloolaba and the Sydney to Mooloolaba Yacht Races. Next to the port is a large shopping, dining and entertainment complex called The Wharf. Underwater World is located at The Wharf and is a great place to learn about and see a number of different sea creatures including sharks. Mooloolaba also features a number of other attractions that you can enjoy. If you want some fantastic photographs of Mooloolaba then visit the famous 'Loo with a View'. The public conveniences have become a fantastic photo spot. Mooloolaba offers a range of Sunshine Coast accommodation suitable for a range of different budgets and styles, including hostels, hotels, resorts and apartments. Caloundra lays claim to 10 of Queensland's most popular patrolled beaches such as Dicky and Kings Beach and the sheltered water of Bulcock and Golden Beaches as well as beautiful rainforests and numerous botanical, environmental and national parks. At Pumicestone Passage you can enjoy fishing and outdoor sports with excellent fishing conditions and water sport facilities. Caloundra have a large variety of restaurants such as Chinese, Thai, Mexican, Greek, Italian, Indian, Aussie, seafood and steak cuisine which something to suit all tastes. Stretching for 65 kilometres are the sandy beaches of the Sunshine Coast, extending from Caloundra north to the Noosa and Noosaville. Visitors to the Sunshine Coast can't go past Caloundra.